Kelley is responsible for the deadliest mass shooting in Texas history. THE GUNMAN WHO opened fire in a small Texas church, killing 26 people during Sunday services, had sent threatening text messages to his mother-in-law before the attack, which appeared to stem from a domestic situation, authorities have said. The man – identified as Devin Patrick Kelley – was once a member of the Air Force, and authorities are starting to piece together what motivated him to perpetrate one of the worst mass shootings in US history. It has been confirmed that he shot and killed 26 people, and injured at least 20 more. Once the shooting started at the First Baptist Church in Sutherland Springs, there was probably “no way” for congregants to escape, Wilson County Sheriff Joe D Tackitt Junior said. Kelley, dressed in black tactical gear, fired an assault rifle as he walked down the center aisle during worship services. He turned around and continued shooting on his way out of the building, Tackitt said. Kelley also carried a handgun, but authorities he did not know if it was fired. The attack claimed multiple members of some families and tore apart a close-knit town of 400 people. An Air Force official has said the man identified by officials to The Associated Press as the gunman in the mass shooting at a Texas church was court-martialed in 2012 and discharged two years later. Spokeswoman Ann Stefanek says Devin Kelley was court-martialed on one count of assault on his spouse and another count of assault on their child. He received a bad conduct discharge, 12 months’ confinement and a reduction in rank. Stefanek also says Kelley served in Logistics Readiness at Holloman Air Force Base in New Mexico from 2010 until his discharge. The Pentagon also confirmed that Kelley was an airman “at one point,” but didn’t provide additional details. People who live near an address listed for Kelley – around 35 miles from the Sutherland Springs church – have said that they heard intense gunfire from that direction in recent days. Another nearby neighbour, who did not want to be identified, said he had also heard gunfire coming from across the street but couldn’t be sure if it came from the property listed as Kelley’s address. The neighbour added that the sound of gunfire is not unusual in the area given the seclusion and the big acreage of the surrounding properties. In recent days, Kelley had posted a picture of an automatic rifle on social media and is said to have used it as his Facebook cover photo. Facebook has since deleted his account. He arrived at the scene of the shooting prepared, with dozens of rounds of ammunition and wearing a mask. The gunman crossed the street and started firing a Ruger AR rifle at the church, said Freeman Martin, a regional director of the Texas Department of Safety, then continued firing after entering the white wood-frame building, where an 11am (5pm Irish time) service was scheduled. 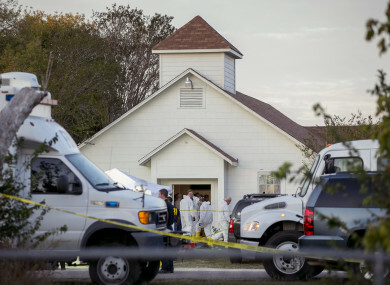 Tackitt, whose territory includes Sutherland Springs, said there was likely “no way” for the church congregation to escape once the shooting started. Tackitt described the scene inside the church as “terrible”. As he left, the shooter was confronted by an armed resident who “grabbed his rifle and engaged that suspect,” Martin said. The man who says he pursued the gunman said he was acting on instinct to try to prevent Kelley from escaping. Johnnie Langendorff said in an interview with KSAT television that he was driving past the church yesterday as the shooting happened and he saw the gunman exchanging fire with a member of the community. He says the member of the community asked for help and got into Langendorff’s truck. They took off at high speed in pursuit of the gunman on a nearby highway as police were going in the opposite direction toward the church. Langendorff says the gunman eventually lost control of his vehicle and crashed. He says the member of the community walked up to the vehicle with his gun drawn and the suspect did not move. The community member stood guard over the gunman until police arrived five to seven minutes later. US authorities have begun searching for Kelley’s motive, and have said that there is no evidence suggesting he was part of a terrorist organisation. Email “Devin Kelley: Police say Texas church shooter attacked after family domestic situation”. Feedback on “Devin Kelley: Police say Texas church shooter attacked after family domestic situation”.